2019 Average Costs of Steel Airplane Hangars: How Much Does It Cost to Build a Steel Airplane Hangar? On average, expect to pay between $15 an $25 per square foot including the cost of the concrete foundation. For customized hangars, the price can rise to upwards of $40 per square foot. A ridge frame building will cost about 25% more than an arch frame metal building. Steel airplane hangars provide a cost-effective yet durable protection for your aircraft. Between purchase and maintenance, you already know that the airplane itself represents an investment of many thousands of dollars. You want to protect that investment with a structure that holds its own against the elements and provides space to both house and maintain your aircraft. Why Choose Steel For Your Airplane Hangar? When it comes to strength, steel is one of the strongest available materials, capable of withstanding hurricane-strength winds when properly engineered and bolted to a concreted foundation. These features make it an ideal structure for housing and protecting aircraft. Prefab steel buildings go up quickly and easily, whether you hire a contractor or go the DIY route. Even if you have to pour the concrete foundation yourself, the time is minimal compared to traditional construction. What's more, even prefab designs are customizable, available in a wide variety of colors, finishes, sizes, and trims. Which Variables Affect the Cost of an Airplane Hangar? A number of variables cause the cost of a steel hangar to vary, chief among them the cost of the material itself, size, and location. Like petroleum or gold, the price of steel fluctuates. Also, like both liquid gold and literal gold, the price typically goes up, though in the case of an economic recession, the price usually drops. The size of the building itself also affects price, as larger buildings typically come at a lower per square foot price than smaller buildings do. Equate it with the per ounce price for a box of rice versus a bag of bulk rice. Pricing variations by steel building size works the same way. Finally, location helps determine price, as it does for nearly everything else. This is true for both the cost of materials and what a contractor might charge. 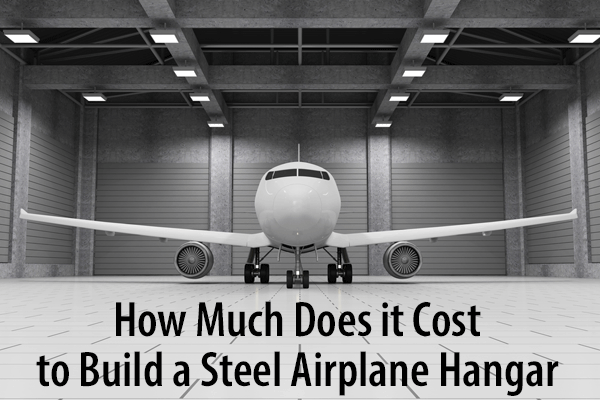 What are Average Costs of a Steel Airplane Hangar? Again, costs vary greatly, but average between $15 and $25 per square foot, including the cost of the concrete foundation. Customization may send the price up to $40 per square foot. Another feature that raises the overall price is adding insulation to the building. Many people decide the additional cost is worth it, since insulation both lowers heating and cooling costs and provides soundproofing. There are two basic types of steel buildings: rigid frame and arch frame. This presents yet another variation in cost, with rigid frame buildings costing more. The cost difference with smaller buildings is minimal, about 25 percent higher for both 20 x 20 and 40 x 40 structures. Please note that these costs do not include the cost of either buying or leasing the land.